Derwent View01433 651637work Self-cateringEnjoy a hundred square miles of spectacular countryside from the sitting room window. Detached, all rooms ground level. Three double bedrooms, 2 with full ensuite facilities and 1 twin-bedded. 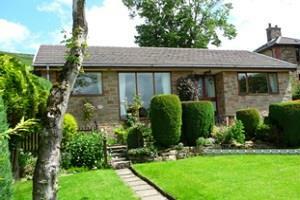 Separate bathroom with bath, sitting room, dining room, fully-fitted kitchen. Lock up garage with off road parking. Private, good-sized enclosed garden with patio and BBQ. Extremely well appointed, very comfortable furnishings.Short breaks available. Owner maintained. Pleasant edge of village location. Two pubs, grocery shop, bakery and post office a short walk away. Situated in the Hope Valley, there is a wealth of beautiful Peak District countryside to visit. To make a booking please consult the grid below or telephone to check the availability of the preferred dates. A deposit of £50 per week is requested, with the balance to be paid on arrival. Your booking will be confirmed within 7 days. Normal bookings are Friday to Friday with an arrival time of 4 pm. Departure time 10 am. Possible Seasonal Discounts for 2 people. Please do not hesitate to contact Joyce or Paul, if you would like more information.